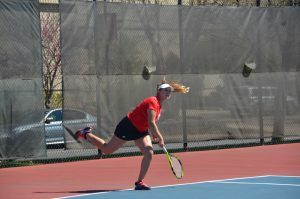 Before heading off on its spring trip, the Bradley tennis team won a tight match at home against St. Louis, 4-3, on March 7. On March 10, they traveled to No. 47 Tulsa and lost 7-0. In doubles play, the duo of senior Malini Wijesinghe and redshirt junior Lindsay Haight lost the No. 2 match 4-6. In singles play, Wijesinghe and freshman Nikki Perlwitz forced a third-set super tiebreaker against their opponents. Head coach Matt Tyler was optimistic about the loss to Tulsa. 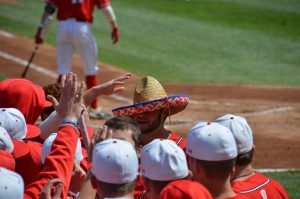 The Braves kicked off their spring break trip with a stop in Mississippi on March 19, but were swept by Southern Mississippi. They then won two wins, beating Nicholls State 4-3 on March 20 and New Orleans 5-2 on March 21. Wijesinghe said the team looked forward to the spring trip in order to prepare for the conference schedule and to boost morale. Despite posting a 2-1 record on their trip, the Braves went 0-3 in doubles play. Tyler said this will be a focus for the team as they go into conference play. On Saturday against ISU, the practice paid off, and the Braves won the doubles point for the first time in four matches. The duos of Wijesinghe and Haight and junior Natalia Barbery and sophomore Sandra Maletin won their matches to obtain the point. Freshman Bozana Lojpur and Barbery brought in the other two points with both their matches going to three sets. Perlwitz went to a third set, but ultimately lost her match 6-3, 3-6, 4-6. The Braves continue their conference schedule with a 2 p.m. match tomorrow at Valparaiso.